In the last eight days at least four different terrorist attacks had been carried out all around the world. Terrorism is the new 21st Century security dilemma, posing a security threat as never experienced before. What makes terrorism so fearful? Terrorism targets civil populations randomly and indiscriminately. Such frivolous characteristics of terrorism give it an unprecedented character that no other security threat has had all along history. The goal of terrorism itself is spreading fear, terror and a general sense of insecurity. As a rule, terrorist organizations target a limited group of civilians in a very unexpected, violent and gory way, aiming these brutal and illegitimate aggressions would transmit its ultimate goal to a broader audience, usually identified as a whole society, or what is worse; the core values which Western societies are based on. Terrorist organization’s modus operandi consists on exacerbating old radical ideologies of Islamism. So sadly, some people usually overlap the concept of Islamism with the religion of Islam. It is not the objective of this article to draw a distinction between this two, nonetheless is important to bear in mind that terrorism is not a religion. Terrorism is about radical political ideologies. If you would like to deepen your knowledge about these two concepts here is an interesting article. Terrorism uses violence as a method to reach its political objectives, put simple, terrorist organizations bargaining power is the propaganda of violence. Although it may sound scary, the fact is that almost every country is a permanent subject of terrorist attacks. Notwithstanding, countries; ideologies and people should remain strong and together to fight against this new concept of crime against humanity. In the light of the past events that have taken place so recently in Belgium, Turkey and Pakistan, among others, World Trade Centre Dublin has decided to write this brief piece analyzing the consequences terrorist attacks may have on the economic system. Although, we take this opportunity to express once more the sorrow we feel towards all those innocent victims affected either directly or indirectly by terrorism, and also to stress that terrorism should always be addressed under a human loss perspective, economic consequences are just collateral damages. How disruptive are terrorist attacks to our economies? The good news is that past major attacks such as 9/11, Madrid 2004 and Paris 2015 have proven to be more resilient to terrorism than actually expected. Even though interdependent, networked and open economies such as the ones prevailing in Europe are believed to create vulnerabilities, the truth is that they may have some degree of interdependency and vulnerability, but at the same time they are advantageous in terms of resilience. Experts argue that strong diversified economies should not experience a great economic disruption. However, it is important to state that some particular sector may be more deeply affected by such attacks, as it is the case of the travel industry. Countries dependent on overseas tourism may experiment a severe recession after a terrorist attack. 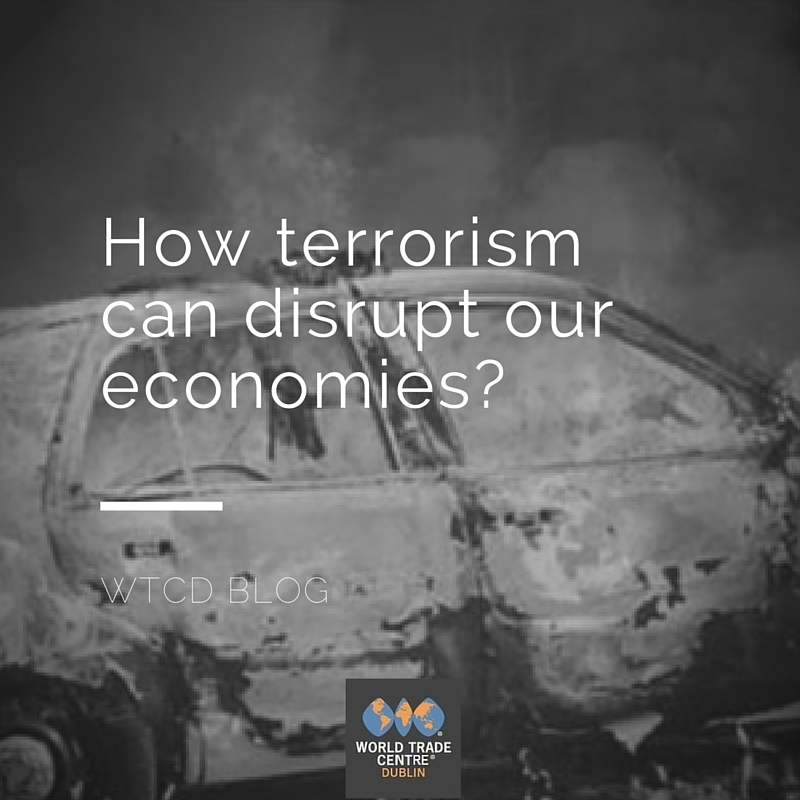 Terrorist aggressions are likely to cause a short-term disruption to the economy. These attacks do not change patters of consumption or economic trends; they only postpone our daily current activities, regardless they are of an economic, social, or working character. In other words, terrorism basically affects every aspect of our lives for a short-time frame economy is no exception. How do financial markets responds to terrorism? An article reported that after Paris attacks markets opened down over 1%, but they managed to climb back and prove resiliency. The terrorist attacks we have experienced have not the capacity of disrupt in a very dramatic way the law of supply and demand, of course there will be consequences but nothing markets cannot bounce back. However there are some sorts of “safe-heaven” financial portfolios that terrorist attacks are not very likely to disruptive such as: security or weapons sectors. This same article mentions that there is no a better safety than preparing your finances strategically. “Reaction to terrorist attacks is often more emotional that fact-based”, that is to say that the effect terrorism may have on our economies is not as damaging as the threat perception society has of terrorism. This means that societies’ concerns about terrorism may depress in a greater level economy than the attack itself. On the other hand, terrorist final goal is not to create economic disruption but to spread their principles and message all around the world. This is somehow, a guarantee to our economic expectations. Terrorism is not an economic event; instead it is a political issue. Ordinarily, it is very hard to predict how different political events may alter the economic system and the markets. In the case of terrorism it just gets even harder: how can we predict the economic impact when we cannot even anticipate to terrorist attacks? However, experts have agreed that the sporadic character of terrorist attacks is not likely to alter the macro-economic trends in the short term. However, if terrorist attacks were to become endemic, great negatives consequences could be expected from this change. Also, it would be very hard to predict the consequences of a bigger terrorist attack with a great magnitude. To sum up, if frequency and intensity of attacks increase, it may depress business and economy in a greater level. Terrorism is unpredictable, however, economies tend to be resilient. Terrorism does not disrupt economies, as much as we may think and these are good news. World Trade Centre Dublin sends our heart felt condolences to all the victims of terrorism, hoping that someday, terrorism stops.